Fallout: New Vegas is a post-apocalyptic action role-playing video game. It is a spin-off of the Fallout series and was developed by Obsidian Entertainment and published by Bethesda Softworks. It was announced in April 2009 and released for Microsoft Windows, PlayStation 3 and Xbox 360 on October 19, 2010. The game is set in a post-apocalyptic open world environment that encompasses a region consisting of parts of Nevada, California, and Arizona. It is set in a world that deviated onto an alternate timeline thanks to atomic age technology, which eventually led to its devastation by a nuclear apocalypse in the year 2077 in an event referred to as "The Great War". This war was caused by a major international conflict between the United States and China over natural resources. The main story of New Vegas takes place in the year 2281, four years after the events of Fallout 3. It is not a direct sequel, but it does mark the return of a number of elements found in the Black Isle Studios-developed Fallout 2. Players take control of a character known as the Courier. While transporting a package across the Mojave Desert to the city of New Vegas, the Courier is ambushed, robbed of the package, shot in the head, and left for dead. After surviving, the Courier begins a journey to find their would-be killer and recover the package, makes friends and enemies among various factions, and ultimately becomes caught up in a conflict that determines who will control New Vegas and the Mojave Wasteland. New Vegas received positive reviews, with critics praising the game's writing, quests, and improved gameplay, while garnering criticism for glitches and bugs on launch. New Vegas was a commercial success, shipping more than 5 million copies altogether, and is estimated to have sold around 12 million copies worldwide. The game also received a Golden Joystick Award for "RPG of the Year" in 2011. Much like Fallout 3, players can switch from the first-person perspective, as shown here, to a much improved third-person viewpoint in New Vegas. Combat is improved upon, with the V.A.T.S. system being updated with several new V.A.T.S.-specific attacks, and a number of kill animations being made for several of the game's melee weapons. Players can use the iron sights on firearms in the game, with the exception of certain larger guns and some energy weapons. The third-person perspective in the game was redesigned to be more "over the shoulder" than it had been in Fallout 3. The Character Creation section of the game was refined to take less time than Fallout 3, with players able to skip the tutorials and proceed across the Wasteland once their character is set up. The option to make any last minute changes to their character occurs when the player steps beyond the boundaries of the starting location of Goodsprings. More Perks were added to the game to provide greater options for improving the player's characters upon leveling up. The Perk system itself changed, allowing a Perk at every other level instead of every level like in earlier games in order to prevent the player from having an overly powerful character early in the game. More weapons were added to the game, including the 9 mm Pistol, the Single Shotgun, Powder Charges, Dynamite, Trail Carbine, and Grenade Launcher. A new skill, Survival, is introduced. This skill impacts how much health is restored by food and drink. Skills have a larger effect on conversation choices; whether a dialogue option will succeed or fail is shown up front, and entirely dependent on Skill level, rather than both skill and chance as was the case in Fallout 3. Players can receive a temporary boost to a skill by reading a skill magazine corresponding to it, which can be found around the Mojave Wasteland or purchased from vendors, the effects of which can be further enhanced by certain Perks. Players can gamble. They can do this by visiting casinos, buying chips with the three major currencies in the games, and playing either blackjack, slots, or roulette within them. Players can also play a card game called Caravan, which was specifically designed for the game and has its own rules, and can be played with certain people outside of the casinos. Although players could craft items in Fallout 3, these items were limited to a few unique weapons. With New Vegas, crafting was expanded to allow the creation of food, drink, drugs, and ammunition along with unique weapons. Crafting can be done at workbenches, reloading benches, and campfires, and requires specific components as well as a sufficient skill level; for instance, cooking food at campfires requires the player to have a sufficient Survival skill level to do so. Some special items cannot be made until their recipes/schematics are found. Players can harvest plants to use in recipes, similar to Bethesda's The Elder Scrolls series. In addition to crafting, players can also modify weapons with special firearm modifications. Such modifications can improve the rate of fire or the size of the magazine, or add a mounted telescopic sight to allow for greater range. Modifications for firearms often require either scavenging for them in the Mojave or purchasing them from vendors. Because of the large number of factions created for the game, developers reintroduced the reputation system that was first used in Fallout 2 and had been absent in Fallout 3. Much like Karma, a player's standing with a faction can change depending on how they interact with them and what decisions they make. If, for example, players help a faction, their reputation with them improves in all locations controlled by that faction; opting to kill their members will cause a loss of reputation. The type of reputation the player has with each faction affects how non-player characters (NPCs) behave towards them; a good reputation might make completing some quests easier, provide discounts with the faction's vendors, and cause faction members to offer gifts; a bad reputation may lead to the faction refusing to help the player or attacking them on sight, or sending assassins after the player. Companions in New Vegas are much easier to control than in Fallout 3, through the use of the "Companion Wheel". Through the Wheel, players can switch a companion's tactics in combat, including their behavior and how they attack, as well as dismiss them, treat them for injuries, and access their inventory. Players are capable of having two companions with them at any one time – one humanoid and one non-humanoid. Companions can confer a unique Perk or advantage and have the opportunity to be improved by completing a special quest related to them. They can also be sent directly to a player's home upon being dismissed rather than returning to their original location. All healing items, including food and water, do not heal the player instantly but work over a short period of time. RadAway also takes time to gradually decrease radiation poisoning, rather than instantly. Stimpaks can no longer heal crippled limbs. Players must either use Doctor's Bags, sleep in an owned or rented bed, use the chem Hydra, or visit a doctor to heal limbs. Ammunition and caps have weight, reducing the amount that can be carried. Players must eat, drink, and sleep, to avoid starvation, dehydration, and exhaustion; failure to do so confers a steady decrease in certain skills and eventually leads to death if untreated. Companions can be killed upon being reduced to zero hit points, rather than losing consciousness. Completing the game on this mode results in either an achievement (Xbox 360/Steam) or trophy (PlayStation 3) being awarded. 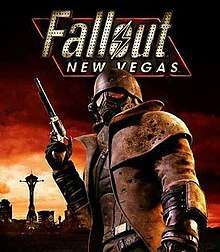 Fallout: New Vegas takes place during the year 2281 and within the region surrounding the former city of Las Vegas (now called "New Vegas"), around four years after the events of Fallout 3, and roughly around 204 years since the Great War of 2077. At the time the game begins, three major powers seek control over New Vegas and its surroundings – The New California Republic (NCR), Caesar's Legion, and Mr. House. Since their last appearance in Fallout 2, the NCR has become overextended and mismanaged, but their expansion eastwards has allowed them to gain control of the majority of territories in the Mojave, with the only threat to their expansion coming from the slave-driving, Roman army-styled forces of Caesar's Legion, led by their leader Caesar, who have conquered and united 86 tribes further to the east, and now plan to conquer New Vegas. Four years before the start of the game, both sides came into conflict at the Hoover Dam, a major landmark that supplies power to New Vegas, and which both sides seek control over. As both sides prepare for a second, inevitable conflict over the dam, Mr. House, a mysterious businessman who presides over New Vegas as its de facto leader with an army of "Securitron" security robots, also seeks control of the dam while ensuring neither side gains control, and is moving towards the final stages of his plans. Much of the game takes place in the Mojave Wasteland, which encompasses parts of the former states of California, Nevada, and Arizona. Along with the three main factions, the region also has a number of minor factions which include: Boomers – a tribe of heavily armed former Vault dwellers who have taken shelter at Nellis Air Force Base; Powder Gangers – a violent group of escaped convicts; Great Khans – a tribe of drug dealers and raiders; and the Brotherhood of Steel – technology-craving remnants of the U.S. Army, who are attempting to secure any technology that could cause significant harm. Along with the Hoover Dam and Nellis Air Force Base, the region has additional landmarks, including its own vaults and the HELIOS One solar energy plant. The protagonist is a courier working for the Mojave Express. The game begins as the Courier is ambushed by a mobster named Benny (voiced by Matthew Perry) en route to New Vegas to deliver a mysterious item known as the "Platinum Chip". Benny shoots the Courier and leaves them for dead, taking the Chip for himself, but the Courier is rescued by a Securitron named Victor and brought back to good health by Doc Mitchell (voiced by Michael Hogan) in Goodsprings. The Courier embarks on a journey across the Mojave Wasteland to locate and confront Benny and get the ‘platinum chip’. The game proceeds according to the Courier's decisions and involves many different events, factions, and characters. The main storyline follows the Courier's pursuit of Benny to both settle the score and retrieve the Platinum Chip. Along the way, the Courier encounters many groups of people with various problems that they can choose to assist with, ignore, or otherwise sabotage, resulting in positive or negative karma. Eventually, after finding Benny and the Chip, the Courier finds themselves in the middle of a conflict between three major factions: Caesar's Legion, a group of Roman-esque slavers, the New California Republic (NCR), an expansionist democratic federation, and Mr. House (voiced by René Auberjonois), the enigmatic de facto ruler of New Vegas, in command of an army of Securitron robots that patrols the city. Each of the three sides aims to control the Hoover Dam, which is still operational and supplying the Southwest with power and clean, non-irradiated water; thus, control of the dam means effective control of the region. It is revealed that Mr. House, a human from before the Great War and surviving via a contained life support chamber, ordered the Platinum Chip's delivery before the war. The Chip is a data storage device with a program that can upgrade the Securitrons to a greater level of combat effectiveness, and was stolen by Benny as part of a scheme to take over House's security and claim New Vegas for himself with the help of a reprogrammed Securitron named Yes Man. The Courier is notified that Caesar's Legion is attacking Hoover Dam, and they must take part to decide the outcome. As the Legion strikes the Dam, led by the fearsome Legate Lanius, the NCR defends its position under General Lee Oliver. Depending on the faction sided with up to the battle, the Courier will either destroy the Dam so no faction can claim it, conquer it for Caesar's Legion, defend it for the NCR or connect the dam's systems to House's network so either he or Yes Man can take control. The game concludes with a narrated slideshow showing and explaining the results of the Courier's actions, the battle for Hoover Dam deciding the faction that comes to power over New Vegas and the Mojave, and the fates of the various other factions based on how the player negotiated with them and which of the major factions emerged dominant. The player then faces a choice to determine the fate of the Mojave Wasteland. New California Republic – siding with the NCR will lead the Courier to defend Hoover Dam from the Legion. The Courier must also lead an attack on the Legate's camp where they have the choice to either convince the Legate to end the fighting peacefully, or they can kill the Legate. The NCR wins the battle and annexes New Vegas and the entire Mojave Wasteland. Caesar's Legion – siding with the Legion will lead the Courier to help attack Hoover Dam. The Courier must enter Oliver's compound where they have the choice to either convince him to retreat for the sake of his men, or they can kill him. The Legion seizes Hoover Dam, forcing the NCR to retreat, allowing them to gain control over New Vegas and the Mojave Wasteland. Mr. House – siding with Mr. House will lead the Courier to enter the control room in Hoover Dam and install the override chip in order to power the Securitron Army. The Courier must either convince both General Oliver and the Legate to stand down or they can kill them. Mr. House and his Securitrons drive both the NCR and the Legion out of Hoover Dam, taking control of it, while still running New Vegas. Yes Man – siding with Yes Man will lead the Courier to go solo (if the Courier helps Yes Man take over New Vegas and Mr. House's Securitrons) and take over Hoover Dam for themselves. The Courier must either convince both General Oliver and the Legate to step down, or they can kill them. The Courier and Yes Man eventually take control of Hoover Dam, while ensuring New Vegas's independence. In 2004, Bethesda Softworks purchased the license to develop and publish Fallout 3, as well as an option to create two sequels, from Interplay Entertainment. Three years later they bought the Fallout intellectual property. Bethesda abandoned the original gameplay style of previous Fallout titles; instead of an isometric game with action point/turn-based combat, Bethesda's Fallout 3 was a fully 3D game with real-time combat as well as the action point-based V.A.T.S. system. Fallout 3 was a critical and commercial success upon its release in 2008, and Bethesda commissioned a sequel. With their own developers busy working on The Elder Scrolls V: Skyrim Bethesda reached out to Obsidian Entertainment, a company founded by several former members of Interplay's original Fallout developers Black Isle Studios, to develop the game. Bethesda and Obsidian decided to create a game that would continue the "West Coast" story rather than the plot of Fallout 3. Bethesda rejected Obsidian's idea to set the game between the events of Fallout 2 and Fallout 3, but they did approve of setting the game in Las Vegas. Fallout: New Vegas was announced in April 2009. Obsidian's development team included former Interplay/Black Isle employees Josh Sawyer as director and Chris Avellone as a writer and director of the game's downloadable content. The plot of New Vegas takes heavy inspiration from the original Fallout 3 that Black Isle developed, commonly known by its codename "Van Buren", which Sawyer also directed prior to its cancellation. The most notable example is the inclusion of Caesar's Legion, a faction originally created for Van Buren. Obsidian also included other factions from previous Fallout games and avoided writing any faction as entirely good or evil, but instead as potential rivals depending on what path the player decided to pursue. The game had a somewhat short development cycle of 18 months. New Vegas is similar to Fallout 3, in that both games use the Gamebryo engine, yet it improved on the previous installment's source code, with some graphics rendering improvements and new art assets, while also reworking the engine to accommodate the extra lights and effects of the Las Vegas Strip. Obsidian also refined the real-time shooting mechanics and added iron-sights aiming to make playing without V.A.T.S. a more viable option than it was in Fallout 3. One PC version of the game relies on Steamworks for online functions, such as achievements and cloud save storage, as well as DRM. A version without DRM was made available by GoG.com on June 1, 2017. Producer Jason Bergman announced the involvement of several celebrities, including Ron Perlman as the game's narrator and Wayne Newton as radio DJ "Mr. New Vegas". He also confirmed that the game would include voice acting from Matthew Perry, Zachary Levi, Kris Kristofferson, Danny Trejo, Michael Dorn and Felicia Day. The team brought on casting director and voice producer Timothy Cubbison to oversee the actor selection and voice production. The game established the new record for the most lines of dialogue in a single-player action role-playing game. The game contains around 65,000 lines of dialogue, beating its predecessor and previous record holder Fallout 3 which contained 40,000 lines of dialogue. Fallout 3 composer Inon Zur composed the score for the game. The game features three major in-game radio stations, spanning several genres of music in the radio waves: сountry, popular music from the 1940s and 1950s, jazz and classical. Each station has a set track list which repeats randomly. Music from the first two Fallout games, composed by Mark Morgan, is used in the game as well. On February 4, 2010, Obsidian Entertainment released the Fallout: New Vegas teaser trailer. A second trailer was first shown on GameTrailers from E3 on June 11, 2010. Bethesda announced four pre-order bonus packs giving specific in-game items, they include the "Classic", "Tribal", "Caravan" and "Mercenary" packs available when pre-ordering at specific outlets, all of the listed pre-order packs were later made available for purchase on September 27, 2011. The Collector's Edition was revealed on May 11, 2010. It was distributed worldwide and is available for Microsoft Windows, PlayStation 3, and Xbox 360. 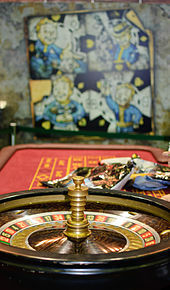 Its enclosed contents include seven real clay poker chips from the Fallout: New Vegas casinos, a deck of cards each with a character on them with information on that person, a graphic novel leading up to the events of New Vegas, a Lucky 38 large platinum chip replica, and a making-of documentary. Fallout: New Vegas was released for Microsoft Windows, PlayStation 3 and Xbox 360 on October 19, 2010, in North America, October 21, 2010, in Australia, and October 22, 2010, in Europe. Within hours of the game's release on October 19, 2010, players of Fallout: New Vegas began reporting a variety of technical issues (saved games becoming corrupted, the game freezing, players becoming stuck within the terrain, and random NPCs appearing behind the player, initiating combat out of context). Bethesda Game Studios stated that they, in conjunction with Obsidian, were actively working on an update for release "as soon as possible" to address in-game issues. They also urged customers to keep their copies of New Vegas rather than return them to stores, stating that providing the best possible experience to their users was a priority. Within a week of the original release, a patch was available for the PC, Xbox 360, and PlayStation 3 versions of the game, which contained over 200 quest and scripting-related fixes. The update released on December 14, 2010, has fixed further glitches and save game problems, including companion-related bugs. Subsequent updates were released in February and April that corrected numerous bugs and gameplay issues. A patch was released on July 5, 2011, that included a provision that automatically creates a save prior to the endgame sequence. After credits, the user is prompted to load this save game, allowing single save players to play DLC without creating a new game. Additional to the official patches the user community started to create community patches to fix remaining issues. On October 18, 2010, Bethesda Softworks announced that downloadable content (DLC) would be available for New Vegas, in keeping with its predecessor Fallout 3. Six add-on packs have been released. The six add-ons are titled "Dead Money", "Honest Hearts", "Old World Blues", "Lonesome Road", "Gun Runners Arsenal", and "Courier's Stash". Overall, the player's level cap is increased by 20, starting at 30 and up to 50 with all add-ons installed. The first add-on pack was released for the Xbox 360 on December 21, 2010, and for PlayStation 3 and PC (via Steam) on February 22, 2011. In Dead Money, the Courier is captured by an insane ex-Brotherhood of Steel leader known as Father Elijah and must work alongside three other captives to find the fabled treasure of the Sierra Madre Casino, concealed from the world by a deadly toxic cloud. The pack adds new achievements/trophies, new weapons, perks, terrain, enemies and decisions for the player, as well as raising the level cap by five. It is the only one of the four story add-ons that cannot be revisited after the completion of its main questline. The second pack was released on May 17, 2011, on Xbox Live and Steam and June 2, 2011, on the PlayStation Network due to the April—May outage. In Honest Hearts, the Courier takes part in a trading expedition to Utah's Zion National Park, when they are attacked by tribal raiders. While trying to return to the Mojave, the Courier becomes involved in conflicts between the tribes and between a "New Canaanite" (post-apocalyptic incarnation of Mormonism) missionary and an individual known as the "Burned Man", Caesar's former Legate, who, after losing the first battle of Hoover Dam, was covered in pitch, set on fire, and thrown into the Grand Canyon. The pack adds new achievements/trophies, perks, terrain, items, enemies and decisions for the player, as well as raising the level cap by five. In Old World Blues, the Courier is abducted and unwittingly becomes a lab rat in a science experiment gone awry and discovers how some of the Mojave's mutated creatures and dangerous technology came to exist. Old World Blues takes place in the Pre-War research centers of Big Mountain, known colloquially as "the Big Empty" or "Big MT". The player can also choose to either turn on their kidnappers or join with them to fight an even greater threat. This pack offers new achievements/trophies, perks, a vast area to explore, and raises the level cap by five like the previous two packs. Old World Blues was released on July 19, 2011. In Lonesome Road, the Courier is contacted by Ulysses, an ex-legionary and courier who, upon seeing the Courier's name on a list of possible deliverers, refused to deliver the Platinum Chip that was ultimately responsible for the Courier's attempted murder. Ulysses was a character whose involvement in the story had been hinted since New Vegas' initial release, and Lonesome Road concludes his story, as well as that of the Courier. Initially, Lonesome Road was planned to be released in August 2011; however, the add-on was delayed until September 20 for unspecified reasons. On September 27, 2011, Bethesda released two content packs titled Gun Runners' Arsenal and Courier's Stash. Gun Runners' Arsenal adds various new weapons and weapon mods (along with new ammo types) to the game, which can be found throughout the game world. Courier's Stash contains all bonus content that was previously only available for pre-ordering the game (the "Caravan Pack", "Classic Pack", "Mercenary Pack" and "Tribal Pack"). On November 3, 2011, Bethesda announced Fallout: New Vegas – Ultimate Edition, which includes the game and all of its downloadable content. It was released worldwide throughout February 2012. On December 29, 2011, Fallout: New Vegas director Josh "J.E." Sawyer released an unofficial mod for the PC version. The mod adjusts the maximum level to 35, halves the rate of increase in player experience points, reduces base player health, reduces the base weight a player can carry, defines certain characters as good or evil rather than neutral, and makes various other adjustments. These are changes that Sawyer wanted to be included in the game, but they were not released as an official update. This mod requires all add-on packs to work. Fallout: New Vegas received "generally favorable" reviews from critics according to review aggregator Metacritic. Critics praised the gameplay improvements and expanded content over Fallout 3, while criticizing familiarity and technical issues. As of November 8, 2010, the game had shipped 5 million copies worldwide, achieving revenue of $300 million. Electronic Entertainment Design and Research, a market research firm, estimates that the game had sold 11.6 million copies worldwide by 2015. IGN's Keza MacDonald praised the game's script, but criticized the character models and facial animation as "wooden and unbelievable". Eurogamer commented that "Obsidian has created a totally compelling world and its frustrations pale into insignificance compared to the immersive, obsessive experience on offer. Just like the scorched scenery that provides its epic backdrop, New Vegas is huge and sprawling, sometimes gaudy, even downright ugly at times – but always effortlessly, shamelessly entertaining." According to GameSpot's Kevin VanOrd, the game's "familiar rhythm will delight fans of the series, and the huge world, expansive quests, and hidden pleasures will have [the players] itching to see what other joys you might uncover. However, as time wears on, the constant glitches invade almost every element of the game and eventually grow wearisome." Giant Bomb's Jeff Gerstmann reviewed Fallout: New Vegas for the Xbox 360 positively, despite its many crash bugs and glitches. Gerstmann wrote: "When I reflect on the experience, I'll probably think about the times the game locked up on me or broke in a dozen other crazy ways first, before thinking about the great world and the objectives that fill it. If you were able to look past the issues that plagued Fallout 3 and Oblivion before it, New Vegas will eventually show you a real good time." 1UP.com's Mike Nelson wrote "On one hand, it feels like I can recommend this to any fan of the Fallout series. I single these fans out because they're willing to forgive silly bugs like meeting characters who walk into walls or occasionally float in mid-air. These fans realize that the game as a whole is greater than the sum of minor graphical anomalies. On the other hand, I simply can't ignore or forgive the game for crashing on me when I walk around the Mojave Wasteland; or for quests that simply can't be completed because of a game glitch; or for making my companions disappear when I need them the most during a battle. These are some of the most frustrating bugs I have ever encountered with any game, especially when attached to a series that I deeply enjoy." ^ a b Stapleton, Dan (April 2010). Decker, Logan, ed. "Fallout New Vegas". PC Gamer (199 ed.). United States of America: Future Publishing (199): 52. ^ "What happens in New Vegas stays in New Vegas". PlayStation 3 Magazine. United Kingdom: Future Publishing: 22–29. 2010. ^ a b c d Sharkey, Mike (February 8, 2010). "PC Gamer, Developers Talk Fallout: New Vegas". GameSpy. IGN Entertainment. Retrieved March 15, 2010. ^ "Fallout: New Vegas Hits the Strip". IGN. May 14, 2010. Retrieved May 12, 2014. ^ "Fallout: New Vegas – Betting on a Caravan". IGN. September 9, 2010. Retrieved May 12, 2014. ^ "Fallout: New Vegas PC Games Interview – Video Interview". IGN. IGN Entertainment. April 30, 2010. Retrieved May 11, 2010. ^ a b "Obsidian's Josh Sawyer on Fallout: New Vegas, the Van Buren legacy and learning from mods". gamesauce.org. Gamesauce Media, Inc. September 8, 2010. 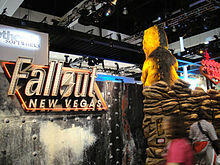 ^ "E3 2010 Live: Fallout: New Vegas Demo" (Video). G4. G4 Media, Inc. June 16, 2010. ^ a b Brudvig, Erik (April 30, 2010). "Fallout: New Vegas First Look". IGN. IGN Entertainment. Retrieved May 17, 2010. ^ "Fallout: New Vegas Achievements". Xbox360Achievements.org. Retrieved October 26, 2010. ^ "Fallout: New Vegas :: Achievements". Steam Community. Retrieved October 26, 2010. ^ "Fallout: New Vegas Trophies List". PS3Trophies.org. Retrieved October 26, 2010. ^ Burnes, Andrew (October 14, 2004). "Interplay In Trouble; Assets Sold & Optioned". IGN. Retrieved May 11, 2014. ^ Boyer, Brandon (April 13, 2007). "Fallout IP Sold To Bethesda". Gamasutra. Retrieved May 11, 2014. ^ a b c Rus McLaughlin (July 21, 2010). "IGN presents the History of Fallout". IGN Entertainment. Retrieved November 14, 2010. ^ Rybicki, Joe (July 1, 2007). "Preview: Fallout 3". 1up.com. Archived from the original on March 16, 2015. Retrieved May 11, 2014. ^ Orry, Tom (April 22, 2008). "Fallout 3 Preview". Videogamer.com. Retrieved May 11, 2014. ^ a b Schreier, Jason (December 17, 2012). "The Knights of New Vegas: How Obsidian Survived Countless Catastrophes And Made Some Of The Coolest Role-Playing Games Ever". Kotaku. Retrieved May 11, 2014. ^ Pitts, Russ (April 30, 2010). "Feargus Urquhart Comes Home". The Escapist. Retrieved May 12, 2014. ^ "Fallout: New Vegas Announced". IGN. April 20, 2009. Retrieved May 11, 2014. ^ Ooi, Will (June 23, 2011). "An Interview with Chris Avellone – game designer, writer, and former 'unlucky schlep'". Gamasutra. Retrieved May 12, 2014. ^ a b c "Fallout: New Vegas; Mining The Past Interview". GameTrailers. August 13, 2010. Retrieved August 13, 2010. ^ a b Kelly, Kevin (May 5, 2010). "Interview: Josh Sawyer on Fallout: New Vegas". Joystiq/engadget. Retrieved September 16, 2018. ^ a b c Webb, Dan (June 3, 2010). "Interview: Josh Sawyer Talks Fallout: New Vegas". Playstationtrophies.org. Retrieved May 12, 2014. ^ Cullen, Johnny (December 5, 2011). "PS3 Skyrim stutter-bug linked to Fallout: New Vegas glitches". VG24/7. Retrieved May 14, 2014. ^ "Interview – Fallout New Vegas". Gamefreakz.co.nz. September 27, 2010. Retrieved May 13, 2014. ^ Faylor, Chris (June 8, 2010). "Fallout: New Vegas PC Using Steamworks DRM". Shacknews. Retrieved May 13, 2014. ^ "Fallout: New Vegas on sale at GoG". GoG.com. June 1, 2017. ^ Snider, Mike (August 9, 2010). "'Fallout: New Vegas' owes Wayne Newton a danke schoen". USA Today. Gannett Company, Inc. Retrieved August 10, 2010. ^ Guinness World Records 2011 – Gamer's Edition. Guinness World Records Ltd. 2010. p. 147. ISBN 978-1-4053-6546-8. ^ Channell, Mike (February 15, 2010). "Fallout: New Vegas developer not dictated by fans". Official Xbox Magazine. Future Publishing. Retrieved May 25, 2010. ^ Lawlor, Scott (October 14, 2010). "The Music of The Mojave Wasteland". Gamasutra. UBM TechWeb. pp. 1, 2, 3. Retrieved October 15, 2012. ^ "Mark Morgan – Bethesda Softworks Forums". Retrieved March 25, 2013. ^ "Obsidian's Lawlor: Original Fallout 1, 2 Tracks In New Vegas As 'Homage'". Retrieved March 25, 2013. ^ "Fallout: New Vegas Video Game, E3 2010: Exclusive Gameplay Trailer". GameTrailers (Press release). MTV Networks (Viacom). June 11, 2010. ^ "Fallout: New Vegas preorders scavenging in-game gear". GameSpot. June 10, 2010. Retrieved May 13, 2014. ^ a b c "Bethesda Softworks announces Fallout: New Vegas Collector's Edition". Fallout.bethsoft.com. May 11, 2010. Retrieved October 26, 2010. ^ Bramwell, Tom (June 14, 2010). "Fallout: New Vegas dated". Eurogamer. Eurogamer Network Limited. Retrieved June 14, 2010. ^ Ransom, James (October 18, 2010). "First Fallout: New Vegas DLC 'exclusive' to Xbox 360". Joystiq. Retrieved October 26, 2010. ^ "Fallout:New Vegas patches arrive". October 20, 2010. Retrieved November 1, 2010. ^ "An update on updates". October 22, 2010. Retrieved October 29, 2010. ^ "Fallout: New Vegas patched on consoles". October 27, 2010. Retrieved November 1, 2010. ^ "Massive Fallout: New Vegas Patch Has Landed". December 14, 2010. Retrieved February 1, 2011. ^ "New update, screenshots for Old World Blues". Bethesda Softworks. July 5, 2011. Retrieved July 8, 2011. ^ Iftikhar, Zawad (November 2, 2010). "Community Patches Fallout New Vegas With Bug Fixes". segmentnext.com. Retrieved August 9, 2011. Fallout New Vegas was the most bug plagued game of the past month. [...]most of these issues have been fixed with a community bug fix compilation patch. Download and Install this patch to fix any remaining bugs, errors, crashes, or other game breaking issues that you are facing. ^ "Fallout: New Vegas Dev weighs in". December 2011. Retrieved March 25, 2013. ^ "Fallout: New Vegas dev blames PS3 lag on restrictive RAM". December 2011. Retrieved March 25, 2013. ^ a b c d e Yin-Poole, Wesley (November 25, 2010). "Fallout: New Vegas DLC raises level cap". Eurogamer. Retrieved November 25, 2010. ^ a b "Bethesda Blog " Blog Archive " First New Vegas DLC Announced". Bethesda Softworks. November 17, 2010. Retrieved November 17, 2010. ^ "Fallout: New Vegas: Dead Money appearing on PS3, PC on February 22, more packs soon". VG247. February 4, 2011. Retrieved February 4, 2011. ^ "Fallout: New Vegas Dead Money hits Steam, PS3 today". VG247. February 22, 2011. Retrieved February 23, 2011. ^ Avellone. "You can return in all DLCs past Dead Money, which was a special case". Twitter.com. Retrieved May 8, 2011. ^ "Bethesda Blog » Blog Archive » New Vegas DLC: Details on Honest Hearts, Old World Blues, and Lonesome Road". Bethesda Softworks. May 3, 2011. Retrieved May 3, 2011. ^ a b "Fallout New Vegas: Honest Hearts on Steam". Valve Corporation. Retrieved May 18, 2011. ^ a b "Bethesda Blog » Blog Archive » New Vegas DLC: Details on Honest Hearts, Old World Blues, and Lonesome Road". Bethesda Softworks. May 3, 2011. Retrieved May 15, 2011. ^ Yin-Poole, Wesley. "F: NV DLC Old World Blues release date". Eurogamer. ^ a b c d e "Lonesome Road coming September 20th; Courier's Stash and Gun Runners' Arsenal one week later". Official Bethesda Softworks blog. Retrieved August 25, 2011. ^ Yin-Poole, Wesley (August 10, 2011). "Fallout: NV Lonesome Road delayed News - - Page 1 | Eurogamer.net". Eurogamer. Retrieved August 10, 2011. ^ a b c d "News — New Release — Fallout: New Vegas DLCs". Valve. September 27, 2011. Retrieved September 27, 2011. ^ "Fallout: New Vegas Ultimate Edition Bundles the Game and All its DLC". 1UP.com. November 3, 2011. Retrieved November 4, 2011. ^ Ashcraft, Brian (December 29, 2011). "Fallout: New Vegas Developer Releases a Personal Mod". Kotaku. ^ Fallout: New Vegas Project Director Releases Personal Mod, The Escapist, December 30, 2011. ^ a b "Fallout: New Vegas Review". 1UP.com. October 25, 2010. Retrieved October 26, 2010. ^ a b MacDonald, Keza. "Fallout: New Vegas UK Review". Retrieved January 19, 2011. ^ a b Whitehead, Dan (October 19, 2010). "Fallout: New Vegas". Eurogamer. Retrieved October 19, 2010. ^ "Fallout: New Vegas Review | Edge Magazine". Next-gen.biz. October 22, 2010. Archived from the original on June 10, 2011. Retrieved October 26, 2010. ^ a b VanOrd, Kevin (October 20, 2010). "Fallout: New Vegas Review". GameSpot. Retrieved October 19, 2010. ^ "Fallout: New Vegas Review – Xbox 360". G4. October 19, 2010. Retrieved November 18, 2010. ^ Kim, Tae K. (October 18, 2010). "Fallout: New Vegas Review from GamePro". GamePro. Archived from the original on December 26, 2010. Retrieved January 18, 2011. ^ Tuttle, Will (October 25, 2010). "Fallout: New Vegas super review, Fallout: New Vegas Review, Xbox 360 Reviews". GameSpy. Retrieved November 18, 2010. ^ "War. War Never Changes. And Neither Does Fallout – Fallout New Vegas – Xbox 360 – www.GameInformer.com". Game Informer. October 18, 2010. Retrieved December 9, 2010. ^ "Fallout: New Vegas". OXM. October 20, 2010. Retrieved November 19, 2010. ^ King, Ryan (October 19, 2010). "Xbox Review: Fallout: New Vegas – Official Xbox 360 Magazine". Official Xbox Magazine UK. Retrieved November 19, 2010. ^ Pearson, Craig (October 19, 2010). "Fallout: New Vegas review". PC Gamer UK. Retrieved November 19, 2010. ^ "Most Bang for Your Buck". IGN. Retrieved January 18, 2011. ^ "RPG of the Year". GamesRadar. October 21, 2011. Archived from the original on September 24, 2012. Retrieved October 21, 2011. ^ "Fallout: New Vegas for PC Reviews". Metacritic. Archived from the original on July 16, 2016. Retrieved July 15, 2016. ^ "Fallout: New Vegas for PlayStation 3 Reviews". Metacritic. Archived from the original on July 16, 2016. Retrieved July 15, 2016. ^ "Fallout: New Vegas for Xbox 360 Reviews". Metacritic. Archived from the original on July 16, 2016. Retrieved July 15, 2016. ^ Richard Mitchell. "Fallout: New Vegas ships 5 million, more patches incoming". ^ Valich, Theo (November 8, 2010). "Fallout: New Vegas Rakes $300 Million at Launch, $50M+ Online". Retrieved January 19, 2011. ^ "Fallout: New Vegas review". Whiskey Media. October 18, 2010. Retrieved October 18, 2010. This page is based on the Wikipedia article Fallout: New Vegas; it is used under the Creative Commons Attribution-ShareAlike 3.0 Unported License (CC-BY-SA). You may redistribute it, verbatim or modified, providing that you comply with the terms of the CC-BY-SA.